If a bright, spacious, modern, and beautiful mansion that’s also energy efficient and has a low carbon footprint sounds like a contradiction to you, I suggest you continue reading. The Conscious Builder’s new Red Castle Passive House is proof that this is possible. Buildings for a Better Future had the pleasure of visiting the Passive Red Castle Project located just outside Manotick on a lovely Saturday afternoon. Casey Grey, the founder and CEO of The Conscious Builder Inc. gave us a tour of his new and beautiful home that’s also a highly energy efficient marvel. The best part is, the design looks simple and elegant! Who said that green had to be complicated? The open house event truly demonstrated what a Passive House can be, helped educate consumers about the 5 most important factors when designing a Passive House, and discussed lessons learned from building Passive Houses. A very pleasant presentation summarized how the house performed in 2015 and the personal tours from Casey Grey himself allowed visitors some great one on one interaction. The Passive House standard results in homes that consume 80%-90% less energy are more comfortable and have healthier indoor air quality. The Red Castle demonstrates the Conscious Builder’s ability to provide customers with a well-insulated home that is air-tight, and pays close attention to passive solar design features. Not sure what any of the technical stuff means? Don’t worry; we will go inside in a moment and explain, but for now, remember that The Conscious Builder can offer you a healthy, comfortable, environmentally friendly, and beautiful home with their builder experience, and passion for conscious living. Now, let’s have a look! The first look at this home inspired two thoughts in my mind. The first: I didn’t know that you could make energy efficient homes so huge! The second: this home is beautiful; I can’t even tell that there’s anything different about it. Even the solar panels on the south side facing the back of the lot seem to blend nicely and are very appealing to the eye. I also noticed how the design of the awnings and roof leave all windows and doors completely in the shade, a clever Passive House technique that reduces the need for cooling in summer. Walking through the front door and stepping into the home was a welcoming, beautiful bright, and spacious open concept interior that features an award winning kitchen, a beautiful double sided bio-ethanol fireplace with amazing stone work, a bright and cheery living room oriented due south to maximize heat gain in the winter, LED pot lights/fixtures, EnergyStar® rated appliances and most importantly, a homey feel. The house felt quite comfortable and was very bright. The “Attitude of Gratitude” jar on the wall reminded me how grateful I was to have a sneak peek at the home of the future. It also made me grateful to see that my current lifestyle will not have to significantly change in order to reduce my environmental footprint. I was grateful to be overcome with the realization that being environmentally friendly doesn’t have to affect my life that much. This home looked like any other, but it wasn’t. That became especially apparent from Casey’s presentation and the mechanical room downstairs. The presentation was extremely educating and full of very valuable information. He discussed many of these details about how this home fulfills these factors which I will try to discuss below, but if you feel that you would like more information you can always via his contact information at the end of his document. Following the presentation we got a tour of the mechanical room and got to see some photos of the mechanical systems. We started by visiting the mechanical room. It was simple and elegant. 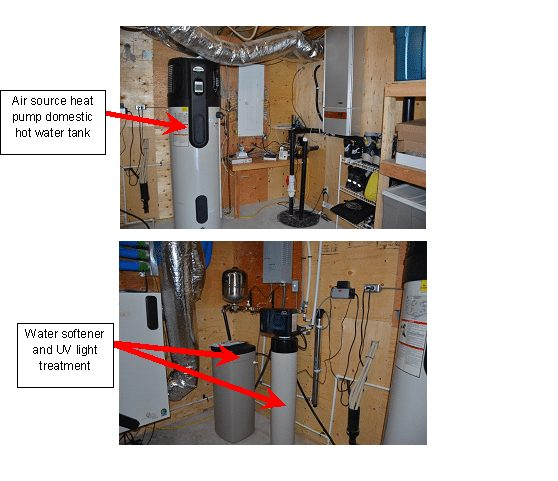 It included an air-source heat pump domestic water heater, which looks pretty similar to your traditional water heater at home, a water filtration system, and two enthalpy recovery ventilators (ERV’s) that are essentially fresh air systems for your home. The ERVs not only circulate the air, they also control the humidity, exchange heat between the air leaving the home and the fresh air entering the home, and they filter the air as well. They are essentially the “lungs of your home” that breathe the air in and out from the exterior. The one thing that always sticks out about these utility rooms is the lack of a giant central air unit (furnace and A/C) and the missing square ducts that you see in a regular home. There are two reasons for this. First is with a very air-tight building envelope it is important to have make-up air and to make sure you’re ventilating properly, hence the ERV systems are used. One of the benefits of this ERV requirement is that the air is guaranteed to be fresh, filtered and at a desirable humidity range, making these homes healthier to live in. 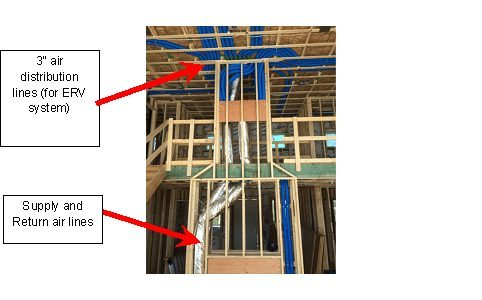 The smaller ducts (3” pipe with a smooth interior surface) distribute this fresh and treated air throughout the home as can be seen in the installation photo below that was provided to us. The second, is that these air-tight and well insulated homes require less heating (this home only requires approximately 18,500 Btu/h for heat compared to an average furnace in this size house which is rated for 80,000 – 100,000 Btu/h) which eliminates the need for a traditional sized furnace and A/C unit. 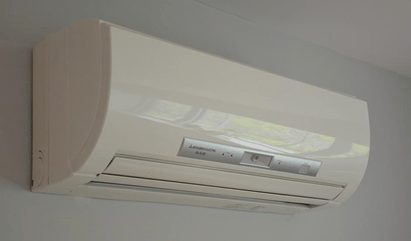 Instead, these newer homes can effectively heat the house with three wall mounted air source heat pumps (photo below). If this seems like too many details and/or too complicated to understand, just remember these three things: IT’S SIMPLER to operate, it TAKES UP LESS SPACE, and IT’S ENVIRONMENTALLY FRIENDLY. This is all possible of course because of the well-insulated and air-tight building envelope which we will discuss next. Exterior walls (upstairs): starting from the inside – out you have ½” drywall, Certainteed Membrain (vapour barrier), a 2”x4” wall with Roxul ComfortBatt® in between, followed by 7.25” of Roxul ComfortBatt®, then a 1/2” Excel Extreme® Sheathing that acts as the air barrier, followed by 2”x6” wall with Roxul ComfortBatt in between and then 2” of Roxul ComfortBoard® then exterior weather covering. Total R value of 73.5 (photo below). Airtightness: The passive standard for airtightness is 0.6 air changes per hour. Air tightness is important because leaky homes allow precious energy to escape, but also allow air to carry moisture into the walls where it condenses, leading to mold, mildew, and structural damage. The ACH of this home is 0.56. 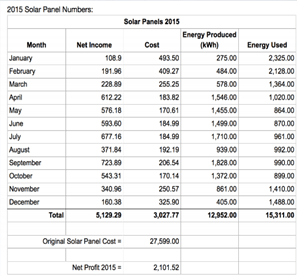 So what does this all mean to the bottom line on your net energy consumption, and of course your energy bill? Well in 2015 the Red Castle Passive House used 15,311 kWh and produced (via its solar panels) 12,952 kWh. This is a net energy use of 2,359 kWh. Compared to the average Ontario home-owner use of 29,444 kWh in 2007 that’s only 8% of the average homeowner! Note: the costs for the Passive Home construction vs. regular Ontario Building Code construction have not been factored in.